History - Korte & Luitjohan Contractors, Inc.
Korte & Luitjohan Contractors, Inc. (K&L), is a fam ily owned, design-build, construction management and full-service general contractor serving the St. Louis Metro Area and Central and Southern Illinois. K& L was established in 1958 when Cyril B. “Pete” Korte borrowed $500 from his father-in-law to buy a rubber tired trencher and began installing gas services for Illinois Power in the City of Highland. A year later, Pete’s brother-in-law, Joe Luitjohan joined him in the underground utility business. For 23 years, the company grew as a quality underground utility contractor. 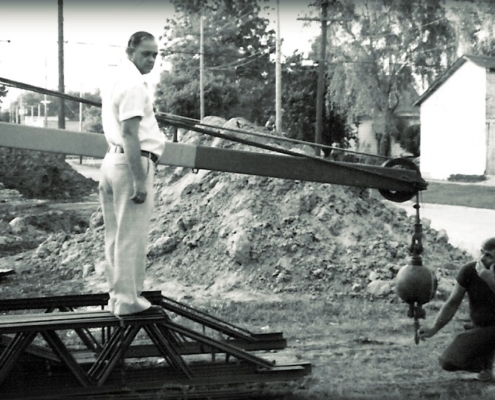 In 1981, Pete bought Joe’s interest in the company and soon K&L began working in the heavy construction market. Ever growing and ever mindful of opportunities in the construction market, Korte & Luitjohan Contractors steadily expanded its scope in three major construction markets – building, heavy and utility. Today, with almost 60 years of experience, and with a diverse inventory of construction knowledge among its staff, K&L satisfies clients’ visions in the building, heavy and utility markets. With its ability to self-perform carpentry, concrete work, piping and excavating, K&L maintains a high degree of control over the entire building process for a very competitive price. We lead our clients efficiently through the design and construction process. K&L’s portfolio includes commercial buildings, professional offices, industrial, municipal, healthcare, religious and educational facilities, as well as infrastructure such as water treatment plants and water reclamation facilities.